Lily Says: It's always a bonus when a beauty product not only works well but also looks good displayed on a dressing table. 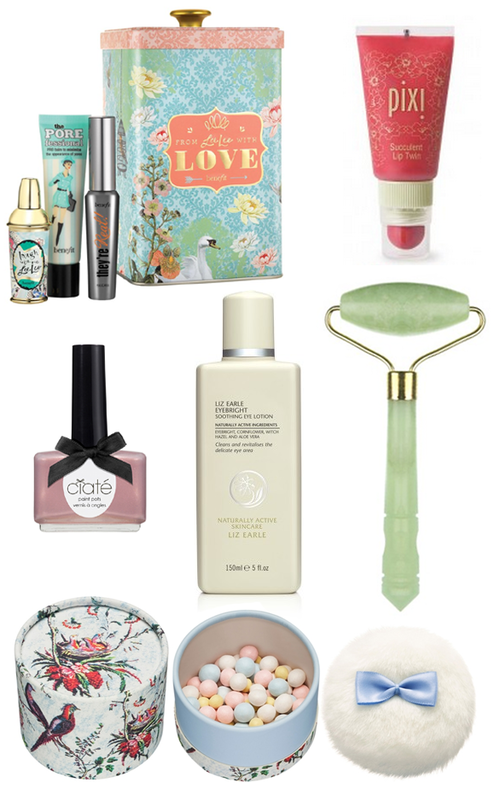 With that in mind, I present this little collection of beauty treats! The limited edition Lee Lee tin from Benefit is not only beautiful in its own right, it also comes with two of my favourite Benefit products - They're Real mascara (amazing stuff!) and The Porefessional primer, plus a hand-bag friendly perfume! I picked products from Pixi and Paul & Joe because not only are they high quality, they also come in pretty packaging, as does nail varnish from Ciaté which is always tied with a little black bow. The Liz Earle Eyebright I had to include because it is a dressing table essential for me - a few drops on some cotton wool wiped over the eyes is so refreshing and also removes any stubborn traces of eye makeup after a cleanse. The cooling jade roller from Ying Yu Rollers is a bit of a cult item. I've yet to try one but from what I hear they work wonders at massaging the facial muscles, reducing puffiness and keeping your skin looking young and fresh. That's got to be worth a try hasn't it?! What are your dressing table essentials?